It was a nice and mild weekend evening when I was serving this beautiful chicken dish with a nice and easy potato salad. Ready! Now I need a good potato salad to compliment this. First of all, heat the oil in the frying pan and season the chicken with salt and pepper. Then, when the oil begins to shimmer, fry the chicken (in two batches) to brown well: remove the first batch to a plate while you tackle the second. Each piece needs to be a lovely golden-brown colour. When the second batch is ready, remove it to the plate to join the rest. 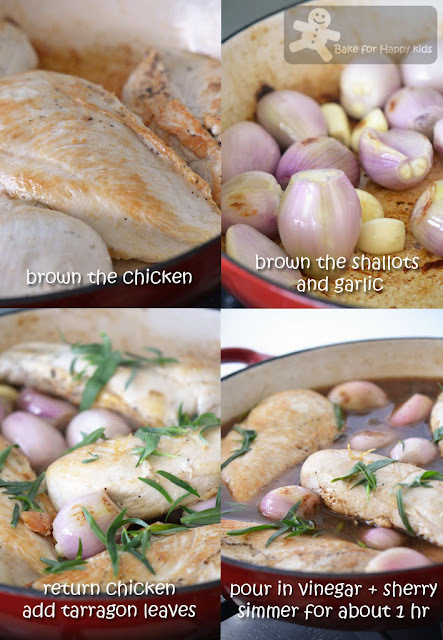 Then add the shallots to the pan, brown these a little, and finally add the garlic cloves to colour slightly. Now turn the heat down, return the chicken pieces to the pan, scatter the tarragon leaves all over, then pour in the vinegar and sherry. Let it all simmer for a bit, then turn the heat to a very low setting, so that the whole thing barely bubbles, for 45 min (I did mine for 50 min). Halfway through, turn the chicken pieces over to allow the other sides to sit in the sauce. When they're ready, remove them to a warm serving dish (right side up) along with the shallots and garlic. The sauce will by now have reduced and concentrated, so all you do is whisk the crème fraîche into it, taste it and season as required, then pour the sauce all over the chicken and scatter with the sprigs of tarragon. This is lovely served with tiny new potatoes tossed in herbs and some fresh shelled peas. Steam the potatoes over a pan of boiling, salted water, covered with a lid, for about 20 min until they are tender. Instead of steaming, I boiled my potatoes. 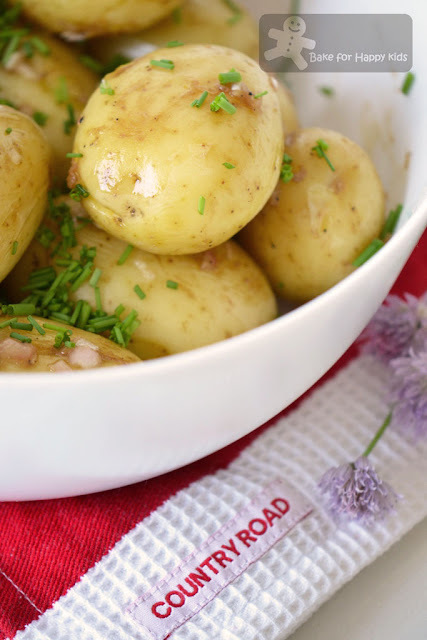 Place potatoes in medium saucepan and cover with cold water. Cover and bring to boil at high heat. Reduce to medium and simmer uncovered for 15-20 min or until tender. Remove from heat, drain off the water and set aside for 10 min. Meanwhile, make up the dressing. 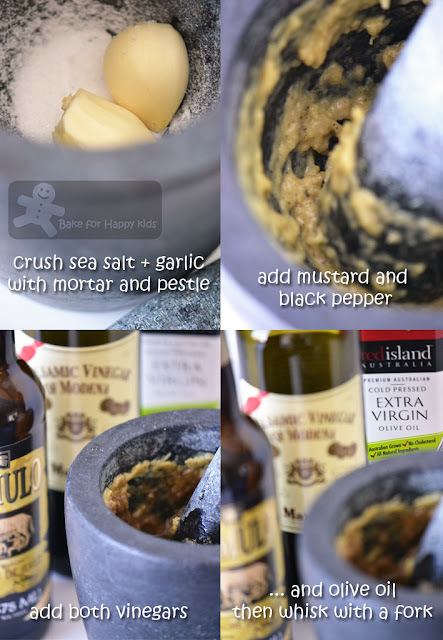 Begin by crushing the salt quite coarsely with a pestle and mortar, and then add the garlic. As you crush it and it comes into contact with the salt, it will quickly break down into a puree. Next, add the mustard and really work it in, giving it about 20 sec of circular movements to get it well blended. After that, add some freshly milled black pepper. As soon as the potatoes are cooked, cool them in a mixing bowl for 10 min, then stir in the vinaigrette and shallots while the potatoes are still just warm. Now add the chives and give everything a good toss to distribute any dressing collected in the base of the bowl and transfer the salad to a serving bowl. 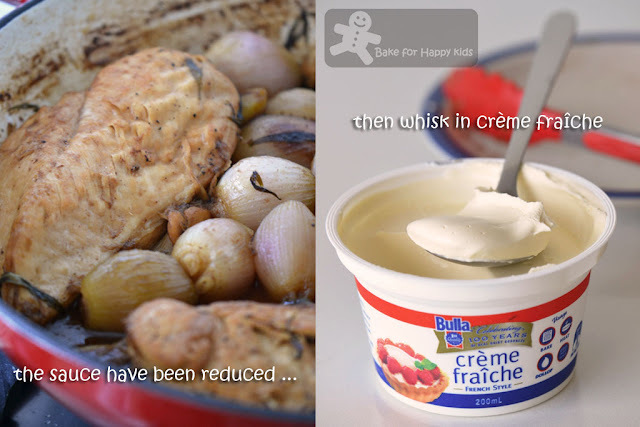 Note: The amount of the above two recipes are very generous portions for 3-4 adults. Knowing this, I have saved an extra portion for my husband's next day lunch. Love fresh tarragon! What an awesome meal. This looks really a flavourful and tasty chicken dish! 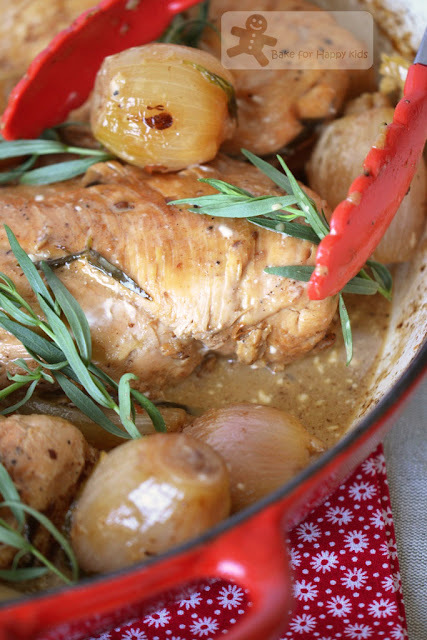 I love the whole shallots in this dish as well and oh....love everything about it. Looks so mouth watering. Chicken and Tarrgon goes so well together. I will take your son's helping of potato! Oooh I saw Wendy cooking a very similar dish, I was drooling over there and now yours! Yum! Zoe, chicken dish, 2 thumbs up as I loveeee chicken so much, haha! You are so westernise, you cook this dish with chicken breast. At home, only my hubby likes to eat the breast, we all want the thigh & drumsticks, haha! What a juicy pot of chicken! 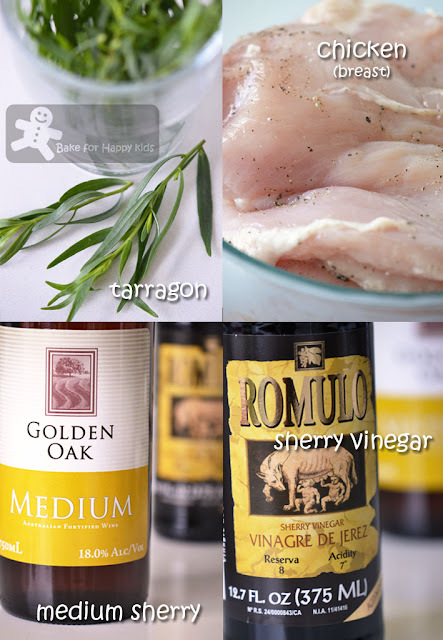 Love the herbs with sherry! Hey Zoe, your boy is so cute.. so is he still eating potatos since he likes potato chips? you know, with so many of delia smith's recipes that you, joyce and lena are trying, I don't need to buy the book. I can just copy from you guys..lol.. this really looks so tempting and so tasty. Did you end up forcing him to have the salad anyway?? Your son must have had too much good food from you- the salad sounds amazing! No, we didn't. Good that he likes and ate the chicken. This sounds absolutely delicious, Zoe. 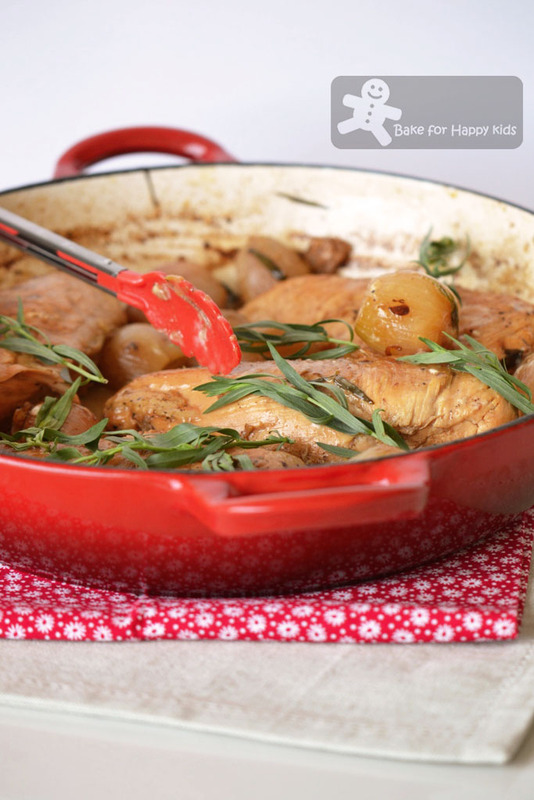 I hv always wanted to try taragon w chicken, will try this one of the weekend soon. Pity ur boy didnt like d salad, it sounds yummy! Looks like a flavourful and comforting dish!! That is one delicious meal! I don't mind having your son's share of the potato salad! I was looking at some recipes and am wondering on sherry vinegar and now I have seen you using it! Your chicken looks so flavourful and yummy! This is elegant comfort food - what a great dish! Wow Zoe, what a delicious and flavorful meal...the chicken looks absolutely awesome paired with the potatoes...yum! HI Zoe! Like Adora's, this is another perfect dish for Sunday lunch! Such a delicious and comfort food Zoe! That sounds like one delicious sauce!